Harkness is open to the public year-round. The gardens, grounds, picnic area, and waterfront are open 365 days a year. Visitors are welcome until sundown. Parking Fees will only be charged on Fridays, Saturdays, and Sundays – Memorial Day weekend, Friday May 25, 2018 through Labor Day September 3rd, 2018. Non Resident : Parking Fees apply to all vehicles without a CT State license plate . 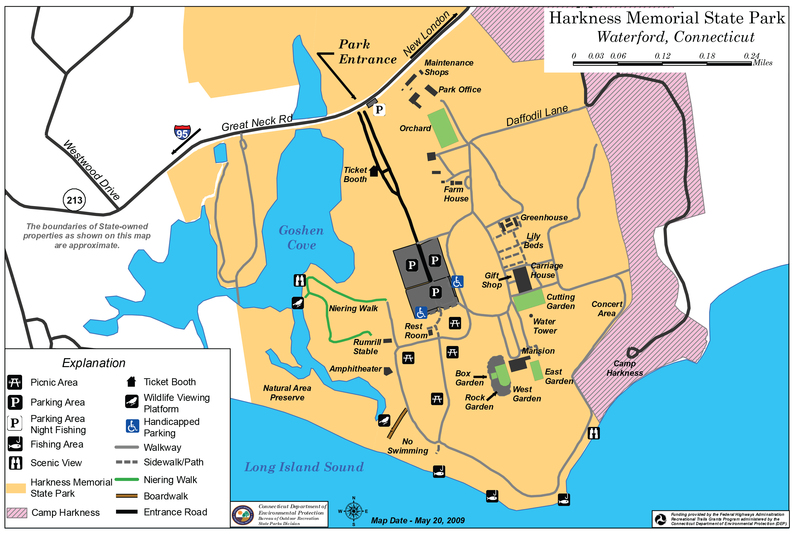 Friends of Harkness volunteer docents lead guided tours on weekends and holidays between Memorial Day and Labor Day. The first tour starts at 10:00 am and the last starts promptly at 2:00 pm. Donations for tours are welcome and most appreciated. Email: docent@harkness.org for additional information and availability. From I-95 South: Go to exit 81. At the end of the ramp, turn left onto access road and proceed to stop light. At light, turn left onto Cross Road and continue to intersection with Boston Post Road, Route 1. Turn left and continue to light at Avery Lane; turn right. Avery will become Great Neck Road, route 213. The park will be two miles ahead on the right. From I-95 North: Go to exit 75, bear right at end of exit ramp and proceed onto Boston Post Road, Route 1. Go 3 miles to Avery Lane and proceed as described above. The gardens, grounds, picnic area, and waterfront are open all year round, 365 days a year.